When I first started playing video poker, I was a little intimidated. I knew how to play poker, and I knew how to play the slots, but video poker was still a mystery to me. Does video poker have a good payout or am I going to be taken to the cleaners? What do I do in those situations where I could throw away a decent hand for a chance at a huge win? After years of practice and many ups and downs at the video poker machines, I have come up with these basic tips for video poker success. 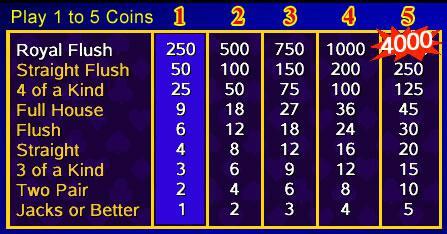 Always play maximum coins. As you can see from the sample video poker pay table below, if you play 5 coins instead of 4, the payout for a royal flush jumps from 1000 coins to a spectacular 4000. Having this advantage in the royal flush payout increases the odds of the video poker machine by a significant margin, making it a smart move to always play maximum coins. Understand the video poker pay table. If you know the basic order of poker hands, the pay table above will probably look fairly straightforward. However, there are some video poker machines that feature pay tables that may look like a foreign language (example below). Before you start putting your money into the video poker machine, make sure you know what the pay table means and how you should be paid for each win. Take your time while playing video poker. Video poker is a machine. It won’t get angry at you if you take your time. Since some of the more difficult decisions require some time to mull over (or possibly time to reference a video poker strategy card), don’t feel like you’re in a rush. Have fun while you’re playing and you will always win more money. Follow these basic tips and you will be well on your way to video poker success! Make sure to follow Silver Oak Casino on Twitter for more money making video poker tips and full strategies to the most popular video poker games. What are your favorite video poker games? Tell me in the comment section below!